I work with a lot of people who are creative in a variety of ways: artists, writers, crafters, scrapbook makers, designers, DIYers...the list goes on and on. I find that the more common tools for organizing their spaces are often too boring to satisfy their creative sides. 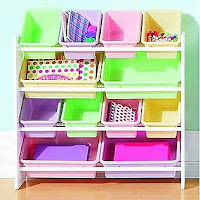 What's an organizer to do? 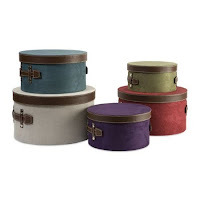 Well, certainly there are some great looking products out there that can add color and texture to a wonderful space. 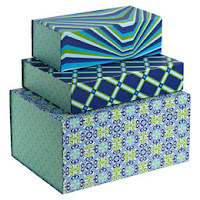 Sometimes fancy, colorful bins will do the trick. These are from Amazon and The Container Store, respectively. Other times, depending on the space, bulkier items need to be relatively accessible - possibly along side a multitude of other items. 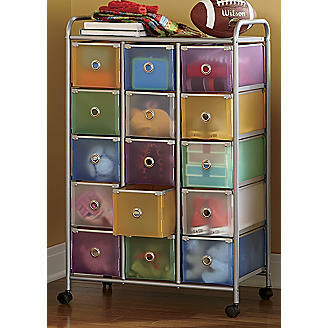 This is great for those involved in larger projects like sewing, making toys, or working with found items. 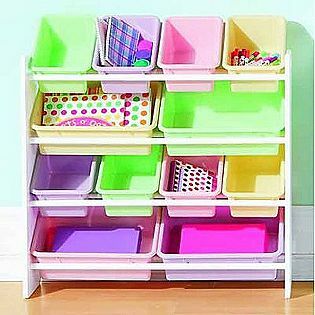 Seventh Avenue has a colorful cart; Kmart, among other stores, offer the very popular storage rack that accomplish these storage concerns. Maybe the containers need to be a little more fluid and interactive? Try something modular for small items. 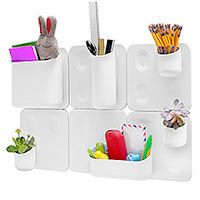 The Urbio Magnetic Modular System, also from The Container Store, might work well for you and all the little pieces lying around. And, if it still feels too dull and rigid, try going all out to create the space you need to get your tasks done. Better Homes and Gardens really out did themselves with a laundry room, if you're looking for inspiration. 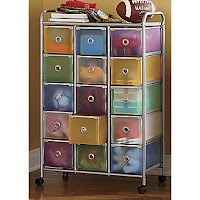 For some, the act of creating your own containers and racks makes the battle of staying organized much easier to tackle. 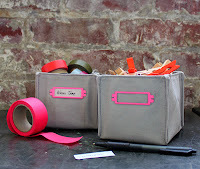 Should you feel inclined to make some custom organizational tools, I've got some ideas to share! (I will caution you, make sure you have the time to make these things first, before you add to your ever-growing to-do list!) The Today Show offers up some fabulous, artsy ways to store jewelry and make-up. The cheese-grater earring rack is my favorite! 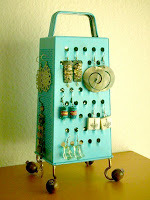 Apartment Therapy also offers up some more lengthy handmade tools to create a peaceful space. And, if you want to try something a little less advanced in skill, take a look at Design Sponge. There, you'll find some new ideas for sprucing up old designs for storage - like these fabric bins, livened up with a bit of color.